Swords were not just weapons but important decorative elements in masculine attire. 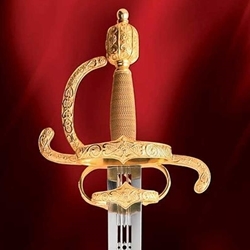 The Castilian Sword is a sword similar in design of the prestigious maker Alonso Perez, who worked at the shop of the famous sword maker, Gil de Almau, who produced several swords for the Emperor Charles V and his son Philip II of Spain. The highly detailed blade has exquisite piercings on its upper section, while the engraving on the hilt is some of the finest Windlass Steelcrafts’ craftsmen have ever produced. The matching ringed scabbard has equally fine engraving and is covered in rich, supple brown leather. Both the guard and the fittings on the scabbard have been expertly plated in stunning 18K gold. Can be sharpened for an additional fee.